Sunday was a beautiful day for football, and Greenwich Youth Football League (GYFL) and their corresponding cheerleading squads (GYCL) had games scheduled for about four hours in fields 6, 7 and Cardinal stadium. Some families dropped players and cheerleaders at the curb, but most stayed a while, watching games, socializing and patronizing the four food trucks parked near field 7. Meanwhile Trinity Church held services in Greenwich High School’s vast student center at 9:15am and 11:00am. At Wednesday’s Parks & Rec September meeting, Joe Siciliano shared his concerns about the Sunday traffic and parking jams at GHS, and said he wasn’t sure emergency vehicles could get through. On Sunday, Parks & Rec’s Recreation Supervisor Don Mohr, who schedules the playing fields for everything from from GYFL, to soccer, flag football and rugby, was taking photos of illegally parked cars as he waited for Greenwich Police to arrive in the south lot. “There are just too many cars at certain times. It’s a safety issue,” Mohr said. Meanwhile two Greenwich Police officers were stationed in front of the school directing traffic through the one-way traffic pattern. Officer Sean O’Donnell said he and his colleague were hired by Trinity Church, and that some drivers unwittingly enter the bus entrance, which is marked ‘Do Not Enter,’ or drive the wrong way along the science wing. O’Donnell said as of Oct 1, Trinity Church members had been instructed to no longer park in the south lot. He said the church had made repeated announcements to that effect. Calls to Trinity Church on Monday were not returned. Meanwhile, GYFL board president Frank Sarcone and Parks & Rec field monitor/town ambassador Wendy Spezzano monitored the parking lots close to fields 6 and 7, where football games were being played and cheerleaders were rooting for them. Sarcone said he works with Parks & Rec to place orange cones to mark off blind spots in the parking lots, though occasionally parents remove them. “We do the best we can and ask our parents to be courteous to one another and not park where they aren’t supposed to,” Sarcone continued. However, he said, there is a perfect storm in the time between 10:30am and 12:00 noon when the Bantam players and their families are leaving, and Juniors are arriving, along with cheerleaders and their families. “It gets really tough,” Sarcone said. “There are a lot of football players and cheerleaders and some families have multiple players and cheerleaders. “It’s the perfect storm when church arrives,” Sarcone said. Sarcone said Trinity Church members aren’t necessarily familiar with the GHS campus. They vie for the same spots as the football and cheerleading families near fields 6 and 7 because they don’t realize they can enter the building through the back via the west lot. Instead they walk all around the building to the front entrance. Ms. Spezzano, who serves as something of a diplomat when addressing parents about parking safely, said she does not have enforcement authority. Only Greenwich Police do. Sarcone said that last year he was able to hire two high school students to direct cars through the gates behind the D wing. He said the effect was to crate a big one-way loop through the lots around campus. Once the south lot was full, cars could pass through to the west parking lot. “That worked great. They whisked cars right through,” Sarcone said. And so, while two officers stationed in front of the building were on the clock, and Sarcone and Spezzano monitored the north lots, Greenwich Police arrived in the south lot to ticket illegally parked cars. And there were quite a few. 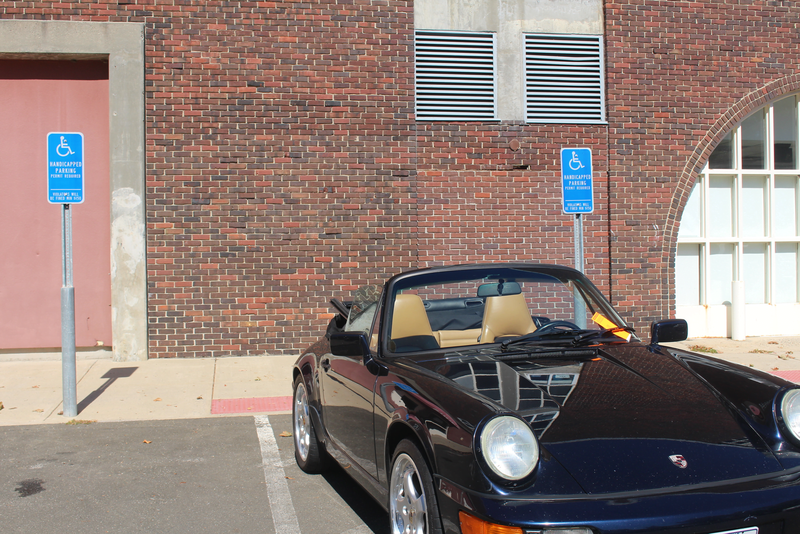 Two Greenwich Police units arrived around 12:30pm and began ticketing cars, starting with a Porsche squeezed between two handicapped spots at the black box theater entrance. Cars were also parked along the landscaped islands in the south lot, which is an active lane. At one point on Sunday, Mr. Mohr said a car parked right across the entrance to the lot. Just as bad, last week, he found two cars parked blocking the gates behind the D wing, blocking access that would be necessary in an emergency. There is a meeting on Tuesday for the Board of Education, GYFL and Trinity Church to discuss possible solutions. We’ll update this story as more information becomes available.